Globalization. It’s a kill or be killed world. Most companies have to expand internationally because the comforts of home can be easily upset by foreign competitors arriving on their doorstep. If a company doesn’t have to reach into overseas markets, there are so many lucrative opportunities it would seem like an obligation in pursuit of maximizing stakeholder value for decades to come. Minimally expanding beyond one’s borders is a defensive move: it’s kill or be killed. International business is though very different from doing business at home. Countries can have different political systems or economic systems. Governments can be secular or non-secular. National leaders can be geopolitically friendly one minute and non-friendly the next. If you think it doesn’t matter if a country has an autocratic or democratic government, you may change your mind when a government official arrives and he is collecting an unofficial fee. This puts you between a rock and a hard place: if you don’t pay it an in-country operation can fail; pay it and you risk going to jail. If you think capitalism and socialism simply refer to the extent of a nations social programs, you may have to think again when new tax rates make it unaffordable to do business in a country. Have you made up your mind to get in on growing markets overseas, but find it so complex you’re thinking about rolling the dice on opening an office in Amsterdam, Lagos, Buenos Aires, Riyadh, or Beijing? Before you do that try to imagine how you would address an unexpected issue of some consequence in one of these cities if you had no rights — rights are for citizens. It will be cheaper and less risky to make decisions on new international markets before taking the plunge. It’s actually pretty easy to sort through perceived complexities. Gender Discrimination. The subordination of woman to man has always existed. What’s different is that it’s no longer legal or condoned. Something else that’s different; discrimination used to be overt, now it takes place unconsciously. It would be a rare someone to admit that they discriminate against women, but according to Project Implicit, 77 percent of people discriminate against women – unconsciously. That includes a lot of women and men. If you want help with training or strategies for globalization or minimizing gender discrimination please give me a call. 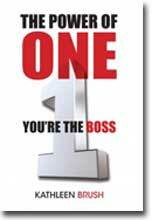 The Power of One: you’re the boss aims to arm any boss (or an aspiring boss) with essential skills that can earn him/her the admiration of others as a competent leader leaving positive marks on his/her patch in the world. It also aims to arm the reader with enough anecdotes on the negative power of one that it becomes evident that a partially skilled leader should not be content and it is nothing to aspire to be.